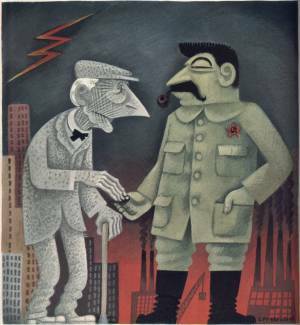 I wasn’t familiar with Miguel Covarrubias until I picked up the issue of Vanity Fair with the very original Mussolini cover (shown below). Now that’s a little different, I thought. This page was inspired by a grouping of vintage Vanity Fair issues that I had recently acquired and the impression that Covarrubias’s artwork left on me. Two of the seven early 1930’s issues I had picked up had Covarrubias covers. 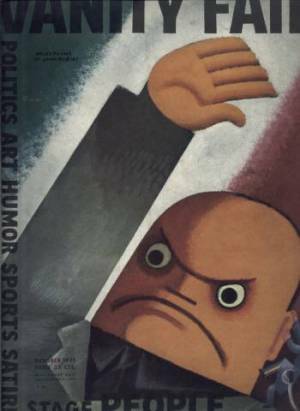 One, the October 1932 issue, was the classic Mussolini cover and the other, April 1932, featured a caricature of New York City Mayor James J. Walker. It was no coincidence that of the issues which sold at auction, it was these two Covarrubias covers which were the only ones to fetch more than minimum bid. Both had minor condition issues and fell into the lower realm of mid-grade, yet the Mussolini issue realized $20.50 and the Walker issue $17.10 (Prices from auctions ending July 27, 2006). The lesson, Covarrubias is collected. A couple of other issues sold at this initial offering, though a few did not. But each of the seven issues offered, which dated between April 1932 and January 1936 contained Covarrubias caricatures, if not on the front covers than on the inside. And the subjects of his “Impossible Interviews” series inside these old Vanity Fair issues are often even more exciting than his covers. “Impossible Interviews” are a single page with a large Covarrubias caricature of two or more celebrities or personalities whom it would be impossible to place in the same room and have hold a real conversation. Of the examples shown below some are more realistic, such as Chief Justice Hughes vs. Al Capone, while others are complete fantasy, such as George Arliss vs. Cardinal Richelieu, the Duke of Wellington and Disreali — real-life historical figures, all of whom Arliss played on film. Beneath each caricature is the text of the interview written by Vanity Fair contributor Corey Ford. 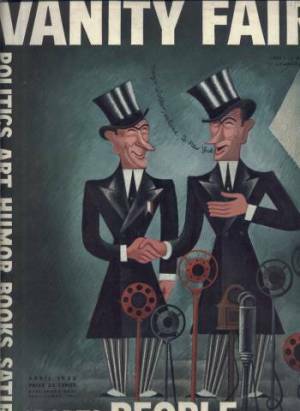 Though Miguel Covarrubias also had his work published in magazines such as The New Yorker, Fortune, Vogue, and even Screenland, these Vanity Fair issues were the first time I had come across his work while preparing magazines for sale. After enjoying the images for myself I realized they’d make a great page on this site for others to see, as these early Vanity Fair issues are not by any means common, so perhaps you’re not familiar with these vibrant images yourself. 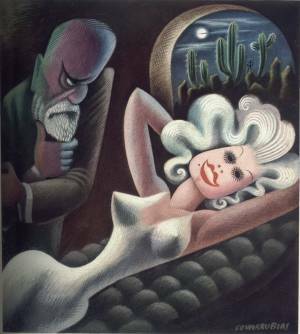 Next, I wanted to learn a little bit about Miguel Covarrubias and so I Googled him and waded through the first fifteen pages or so of results. Unlike some of the other personalities on this site, there was a decent amount of information available on Covarrubias, much of it original. Of particular interest were an American Heritage article about Covarrubias from the December 1995 issue by Edward Sorel and an article by Johnna Rizzo titled “Covarrubias’s Early Days in New York” from the May/June 2006 issue of Humanities. The brief biography of Covarrubias that follows was culled from information from those two articles as well as some common knowledge found across several other sites. After learning a little of this Renaissance Man Covarrubias’s caricatures seem overshadowed by his vast interests and other expertise. 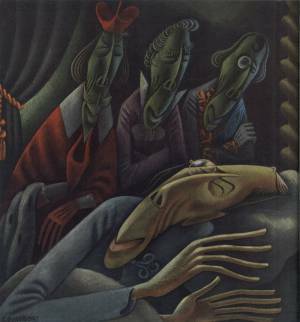 Born in 1904, Miguel Covarrubias came to New York from his native Mexico in 1923. Introduced to Vanity Fair editor Frank Crowninshield, his caricatures would appear on Vanity Fair’s pages as soon as the January 1924 issue. Covarrubias took to the Harlem scene and would illustrate the books of some of the most important writers to evolve from that movement, Zora Neale Hurston and Langston Hughes. 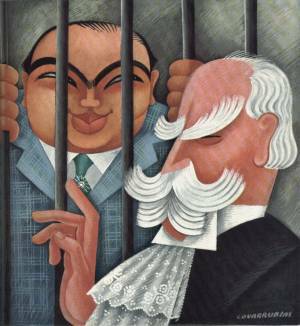 Covarrubias was a regular with Vanity Fair until it folded with the December 1936 issue, but by that time he was losing his interest in caricature in favor of anthropology, a pursuit he had taken up during a nine-month stay in Bali. Covarrubias would leave Manhattan to return to Mexico where he continued his study of anthropology and ethnology with his focus on ancient American cultures. Besides these pursuits Covarrubias wide-ranging interests included archeology, folk art, he wrote, and he was involved with the theater and dance choreography in Mexico. He had several interests, threw himself completely into each, and leaves the casual outsider wondering when he would have time for any non-artistic pursuits. Covarrubias died in 1957 due to complications from ulcers. According to the Sorel piece “Obituaries concentrated on his anthropological works, and his caricatures received relatively little mention.” I think the images found on this page help make the case that this lack of mention was likely due to the passage of time since Covarrubias’s hey day at Vanity Fair and perhaps also illustrates to what degree he was involved with his other passions. 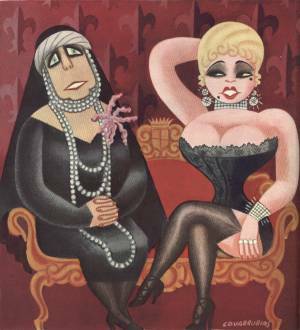 On his earlier days and pursuits, Rizzo writes “The new calling cards of caricature were to be style and restraint, and Covarrubias was masterly.” I’d rather that be the final word. The images that appear above and below are all from issues of Vanity Fair that I have sold on eBay.